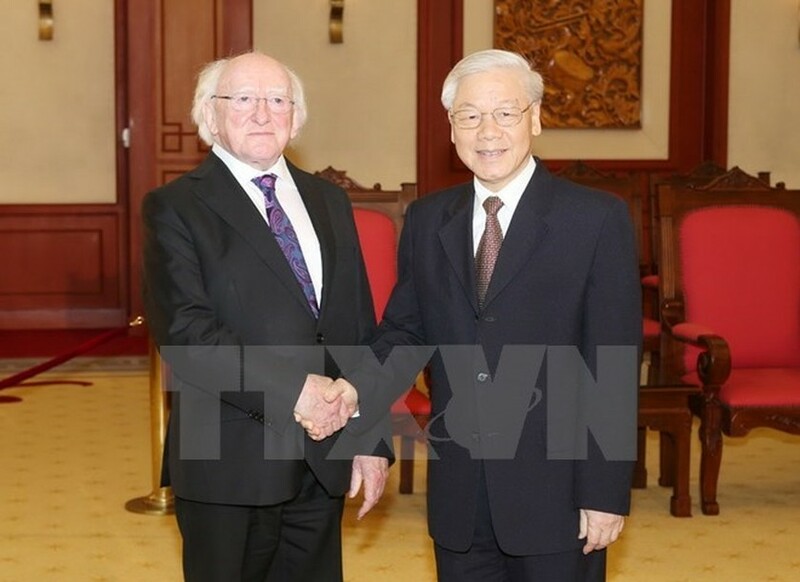 The Irish Government considers Vietnam an important partner in the region and wishes to enhance multifaceted cooperation with Vietnam, particularly in trade, investment, education-training, renewable energy, and climate change response, President Michael D. Higgins has said. During a meeting with Party General Secretary Nguyen Phu Trong in Hanoi on November 8, the President said the maintenance of a peaceful and stable environment for sustainable development is one of the most important issues at present, and called for peacefully settling disputes at sea in line with international law, particularly the 1982 United Nations Convention on the Law of the Sea. He believed that the Vietnam-Ireland ties will continue growing positively, contributing to European Union-ASEAN ties, and for the sake of peace and development in the region and the world. Party leader Trong expressed wish that both countries would facilitate high-level visits and boost cooperation across agriculture, clean energy, high technology, education, climate change response, post-war recovery, implementation of sustainable development goals, and increase liaison at international forums for global peace, security and development. During a reception for the visiting Irish President, Prime Minister Nguyen Xuan Phuc affirmed that Vietnam wishes to nurture all-around ties with Ireland and welcomes Ireland’s policy of strengthening collaboration with Asia-Pacific, including Vietnam. In the first nine months of this year, two-way trade between Vietnam and Ireland neared 800 million USD, tripling that in 2015. Irish investment in Vietnam, which currently stands at nearly 21 million USD, needs to increase in the near future, he said. Vietnam pledges all possible support to Irish investors, the PM said, suggesting that Ireland should make it easier for Vietnam to export farm produce to the country. According to him, both sides need to promote trade and business connectivity, share experience in agriculture and technology transfer in agro-forestry-fisheries. The host wished that Ireland would urge the EU to promptly sign the free trade agreement with Vietnam, welcomed Ireland’s national strategy on development cooperation with Vietnam for 2017-2020, and hoped that Ireland would continue assisting Vietnam in poverty reduction, climate change response, and education. Higgins, in reply, briefed the host about the outcomes of his talks with President Tran Dai Quang, adding that he is keen on continuing to work closely with Vietnam to support the needy in remote and mountainous areas, and share experience with Vietnam in gender equality and institutional building. He hoped that Ireland will serve as a gateway for Vietnam to access the EU market and Vietnam will help Ireland navigate the 600-million-population ASEAN. Ireland wants to share experience with Vietnam in green economy, privatisation, merger and acquisition, technology transfer, he said, adding that Ireland supports Vietnam-EU FTA. Host and guest agreed to intensify multifaceted cooperation, back their bid to run for a non-permanent seat in the UN Security Council, share experience in agriculture, study the law of the sea, as well as boost cultural ties to raise mutual understanding between the two nations.